1. Start by sitting comfortably. Can be on the floor cross –legged or even in a chair at work or on the bus. Just give yourself some mental space and allow yourself to be as comfortable as you can. 2. Place your hands over your lower belly, just under your belly button. Breathe regularly but notice your breath. You don’t need to change it. Just ask yourself, “How does it feel breathing in?” “How does it feel breathing out?” Just breath with open curiosity for your breath. Keep it relaxed. 3. After a few minutes of relaxed breathing imagine that you have another nose just under your belly button. When you breathe in, breath in through your real nose and also through your imaginary tummy nose. When you breathe out, breathe out through your mouth(pregnancy). Allow your inhalation to fill not only your lungs but also your whole abdomen. When you release your breath, feel your tummy and lungs get smaller, making space in your body. Space for the in- breath, the new fresh clean air. Take it in and allow it to fill you with peace and vitality. Then let in go, allow yourself to be empty, ready to fill again. This rhythm of breath, inspiration and exhalation mirrors the rhythm of your cells. They take in nourishment and nutrients and expel what they no longer need. This rhythm of breathing mirrors the subtle rhythm of the cerebral fluid and the pulse of the heart. It is the rhythm of opening and connecting, taking in and the flow of closing and protecting, letting go. It is simple and vital and life. 4. 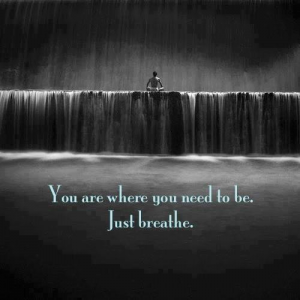 When you are ready let your breathing go back to normal. Allow your awareness to return to the room you are in. And thank your body for the gift of breath. This is a nice calming exercise for mamas & partners out there to practice.